How to convert to dynamic disk easily and safely is puzzled by many users. AOMEI Partition Assistant Pro Edition built in Dynamic Disk Manager can help users convert basic disk to dynamic disk with data security. It is well known to us that basic and dynamic disk are two types of computer hard disk. As usual, a basic MBR disk contains up to four primary partitions or three primary partitions and one extend partition, while there is up to 2000 dynamic volumes in dynamic disk. Dynamic disk is supported (readable) by Windows 2000, XP Professional, Windows Server 2003, Vista Ultimate, Vista Enterprise, Windows 7, Windows 8/8.1, Windows 10, Windows Server 2008(R2), Windows Server 2012(R2), and Windows Server 2016. But it still has many benefits leading users convert to dynamic disk. Separate dynamic disk can be combined into a single dynamic volume, split data among several dynamic disks for increased performance, or duplicate data among several dynamic disks for increased reliability. It can resize the dynamic volume without reinstalling the windows system. 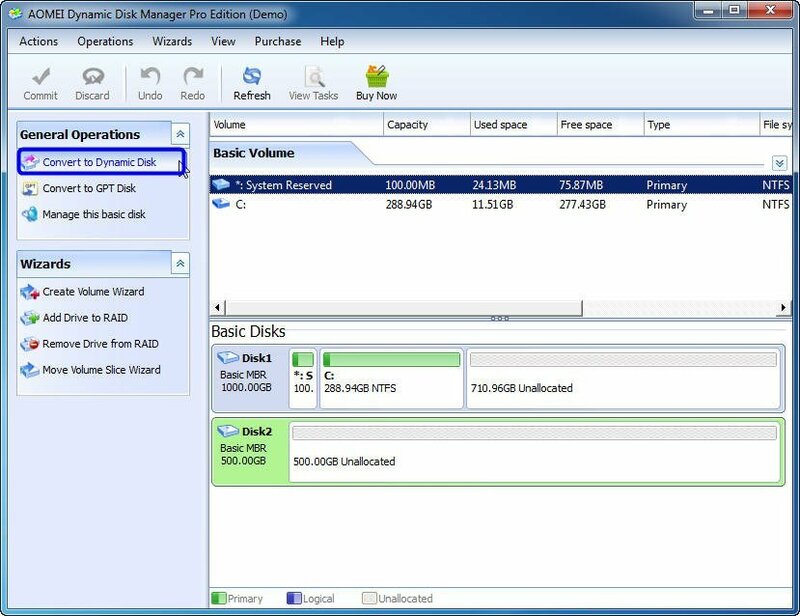 With the help of Dynamic Disk Manager, you can convert to dynamic disk easily without data loss, resize dynamic disk, extend dynamic system volume to solve “low space of C drive” safe and keep data safe, initialize disk as MBR or GPT much easier than Windows Disk Management, etc. Here is the tutorial of how to convert to dynamic disk. You can get in and have a look. AOMEI Partition Assistant Pro Edition is a powerful and reliable hard disk manager packed full with more than 30 brilliant functions. It contains many basic and advanced features to manage your disk. You can resize and move partition, merge partitions or merge unallocated space into big one, migrate OS to SSD, easily create bootable CD, etc. Especially the built in Dynamic Disk Manager, it is designed for converting to dynamic disk and manage your dynamic disk volume easily and safely. If you want to convert dynamic to basic without data loss, the function Dynamic Disk Converter built in Partition Assistant also can achieve this goal.